Learn about the many benefits of LTL shipping with AFP Global Logistics. Not every business has a consistent need to send out large volume shipments, nor do they have the ability to delay shipment transit times while waiting to fill a full truckload. 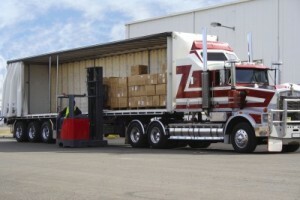 Clients and customers are expecting their packages to arrive on time, regardless if sending a half-empty truck is not cost-effective for the business. With AFP Global Logistics on your side, we are able to develop logistics strategies making shipping affordable and efficient when shipping in small volumes. In these types of cases, the strategy is creative LTL shipping! Read on to find out more about the benefits of LTL shipping services. One of the major drawbacks of shipping a small amount is having to pay for the use of a larger truck despite not needing it. This can become very costly. With LTL shipping, clients do not have to worry about this cost-prohibitive factor standing in their way. Please see below for benefits of LTL shipping. Reduced Costs: when booking an LTL shipment, clients only pay for the portion of the trailer used. The rest of the cost is covered by the other occupants of the trailer space. Increased Security: Most LTL shipments are packaged into pallets before being loaded onto a truck. One well-packaged pallet has a better chance of remaining secure than shipments with multiple small handling units. This reduces the clients’ risk of shipment damage. Additional Service Options: When shipping LTL, clients’ gain access to special services like lift gates, inside pickups, and inside deliveries. Tracking: LTL carriers offer tracking capabilities through the bill of lading (BOL) number, PRO number, PO number, shipment reference number and pick up date range, to name a few. Location: Generally, the further the distance, the higher the rate. Dimensions: The dimensions and weight of the shipment help determine the freight class, which directly impact the rate. Mode: Most shipments are ground freight. Expedited or guaranteed are offered for an additional fee. Type: A shipment that requires special handling or equipment (perishables, fragile, or hazardous items) will likely have higher costs. Class: The commodity of the freight determines class. Higher the class, the higher the rate. There are additional services that are offered when it comes to LTL shipping. These additional services come with added costs. Please see below for additional services offered through the LTL shipping program. Expedited: When clients need goods to arrive at their destination more quickly than the standard transit time, request an expedited freight quote. Liftgate: Used when freight exceeds 100 pounds and the receiving or pickup location does not have a dock for the shipment to be moved quickly from dock to truck. Limited Access: This service is required for deliveries heading to locations that have limited access for carriers, such as construction sites, colleges, schools, residential, malls, etc. Inside Pickup and Delivery: If the carrier needs to enter the building to obtain freight to load or complete a delivery by bringing it indoors, the client must request this additional service. For a customized logistics handling experience that places clients’ needs above all else, AFP Global Logistics is the best and only choice! We provide a full range of shipping services, and our 25-plus years of experience gives us the tools we need to develop customized logistical solutions to each and every individual client. For more information or to start designing your own logistic solutions today, get in touch with AFP at 410-590-1234 (toll-free 800-274-1237), email us at info@afplus.com, or fill out our quick and easy contact form here! This entry was posted on Friday, February 8th, 2019	at 9:38 am	and is filed under Domestic Shipping	. You can follow any responses to this entry through the RSS 2.0	feed. Both comments and pings are currently closed.